PreS-Gr 2 –It’s said there’s a story behind every name and Alma Sofia Esperanza José Pura Candela is surely a moniker worthy of six tales. MARTINEZ-NEAL, Juana. 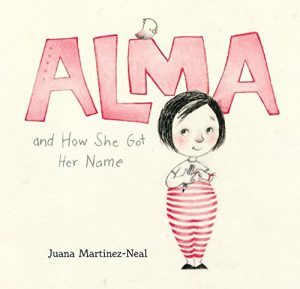 Alma and How She Got Her Name. ISBN 9780763693558. ————. Alma y cómo obtuvo su nombre. Spanish ed. ISBN 9780763693589.
ea vol: illus. by Juana Martinez-Neal. 32p. Candlewick. Apr. 2018. Tr $15.99.